Triple and Synetic joined forces a few months ago. The result? A state-of-the-art cloud platform, running on Kubernetes and developed according to the most modern hosting principles. More than five years ago, Triple and Synetic developed a specialized hosting environment. Because this environment struggled to meet current needs, it was time for renewal. A great moment to do it radically different. Together we set up a project team and created a vision for a new hosting solution. The starting point was the need for flexibility, speed and manageability. But how do you develop a platform that does offer the flexibility needed to deploy different web technologies, and to be able to respond quickly to the needs of a customer? For a few months, the project team met on a weekly basis. 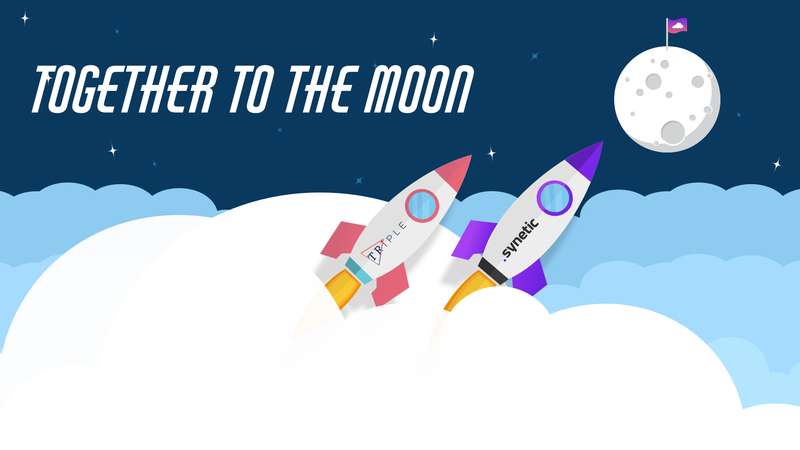 The result of our collaboration with Synetic is a brand new, modern and high-quality hosting platform, developed in the cloud with Docker containers and Kubernetes. Cloud hosting is the future and has formed the starting point for the new hosting platform. We considered all large cloud providers, but Google Cloud was the most suitable option. Google Cloud was not only at the cradle of Kubernetes, the go-to open source system for modern cloud hosting but also offers the highest performance with the most features. Kubernetes (Greek for helmsman) works with containers. The system runs applications on a cloud server, thereby isolating processes by placing them in so-called Docker containers. This provides a huge increase in flexibility, speed and safety. The containers are lightweight virtual machines that do not emulate a whole machine, but only the minimum necessary elements. Google is at the forefront of container hosting and has been using the technology internally for over ten years. Up to now, Google's largest enterprise customers, in particular, have used it. Together with Synetic we make Kubernetes available and affordable for small and medium-sized businesses with the newly developed cloud platform. With the cloud platform, the use of GitLab's CI / CD pipelines (Continuous Integration and Delivery) means that the time to market is considerably shorter. Each release can be tested automatically and customers see new functions quickly realized on their website, without being limited by fixed release moments or biweekly slots. On the platform, a completely new application can be run at the touch of a button, in its own hosting environment. A new instance of the same type of site in multi-site setups, without one influencing the other negatively, and with its own database. For example, campaigns can be set up quickly and there are opportunities for A / B testing. Kubernetes is at the helm of the platform and manages the whole. It pushes new containers forward when there is more traffic and removes containers when it is quieter. If a container falls over, the self-healing system automatically provides a new one. In the setup of Synetic and Triple, he even sets up temporary test environments when requested. Where customers with a VPS often pay a lot for capacity that they do not use, this is no longer the case. This allows companies to use their system resources in an extremely efficient way. Customers who work with an OTAP street (development, testing, acceptance and production) can turn off everything they do not use outside office hours. Pay per use as it were; this saves the platform unnecessary costs. By embracing GitOps and Terraform, the hosting on the new platform is tackled in a different way. From imperative to declarative: Terraform describes what the system must do at all times. Kubernetes comes up with the steps that need to be taken. All adjustments to the hosting environment are just like the application with GitOps in version management and are peer reviewed. This gives customers High Availability without having to dig deep into their wallets. The unique thing about the new hosting platform and the application of Kubernetes is the way in which a combination of new technology is offered in the form of standard packages. Thanks to the scalability of the platform, smaller customers with high demands are served in a common cloud environment, while larger customers are facilitated in their own cloud cluster. A nice synergy with which the cloud platform serves two different types of customers. New technology offers new possibilities and provides new energy. That is why we invested in it with conviction. The partners help a large part of their customers into the future with this new platform. Moreover, the cooperation between the two companies has taken on a new dimension with the development of the platform. They strengthen each other more and more, both technically and in terms of content. The worlds of DevOps, hosting and production come closer together with the Kubernetes platform. The new tech stack also motivates and ensures that the people who develop the cloud platform get even more satisfaction from their work. With a joint inspiration session, Triple and Synetic carried out the official kick-off of the cloud platform early april. An event where people from both agencies get to know each other better, make each other enthusiastic about this new technology and they expand their knowledge. But wherever the glass is raised on the creation of a future-proof hosting platform.